When I was a kid I remember constantly having throat problems. I had all the -itis already, laryngitis, bronchitis, tonsillitis. I recalled that one “Hey Arnold!” episode when Gerald had to have his tonsils removed, and the doctor said he could have all the ice cream he wants. I thought to myself “Maybe if I will have my tonsils removed, I can get as much ice cream I want.” Never had my tonsils removed, but I still always crave for the cold sweet dessert. 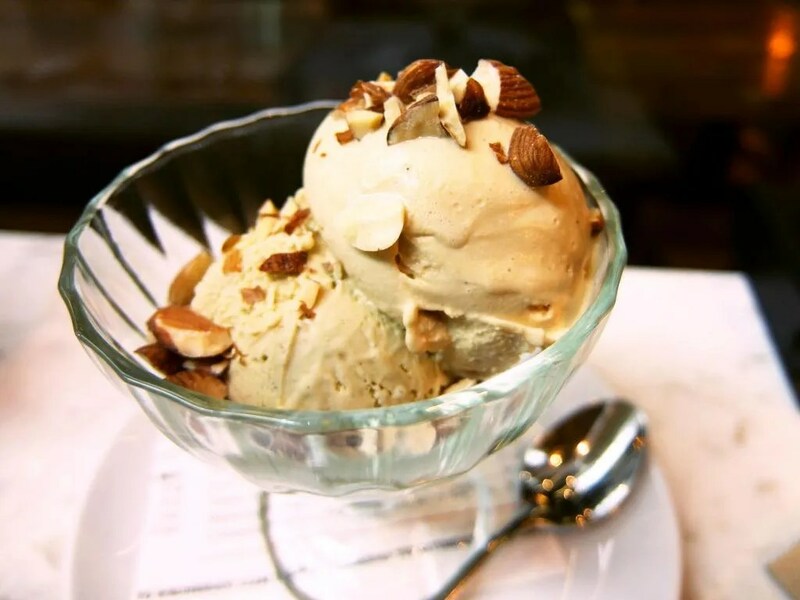 Ice cream has always been my main comfort food ever since I was a kid. There’s something about it that could instantly make me happy. When I found out that there’s a new ice cream place in town, I just knew I had to go and try it out. Farmacy, from what I have gathered, is a concept brought by the Wild Flour group. 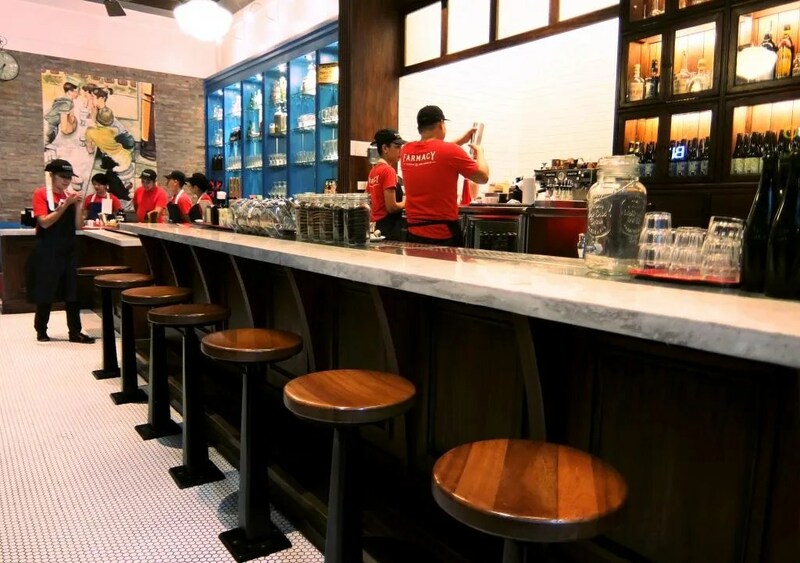 It’s an “ice cream and soda fountain” shop, meaning it’s not all about ice cream and milkshakes, but also sodas, alcohol-infused floats, among others As much as I’d like to say that the place recreates ice cream parlors back in the day, well, I never saw one, too young to have reached that era. But the interiors are really nice. 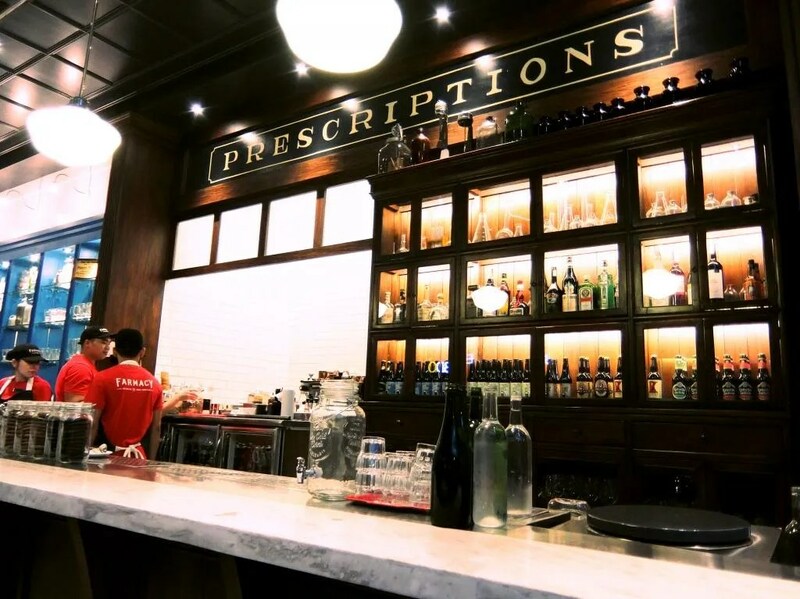 It does have a “[ph]armacy” feel with its vintage medicine cabinet, and signage here and there. Random thought: I wish they devoted some space instead under the “Prescriptions” for their menu. It makes more sense. It’s more in-line with their theme. I think. They have a lot of flavors to choose from. Back in December when a colleague and I tried Farmacy, I got Stracciatella and it got me into a throwback mood having first tasted that in Italy, but in gelato form. When I went back the other day, I got myself a pistachio and salted caramel, and added some almonds. To my surprise they were both brown. Lame for this post, I know. I will update this with another one the next time I go back. Verdict: It’s pretty good. They didn’t overdo it with the creaminess of the ice cream. I really need to try their sundaes and their drinks next time. Specially the milkshake. I wonder if it brings the boys to the yard? 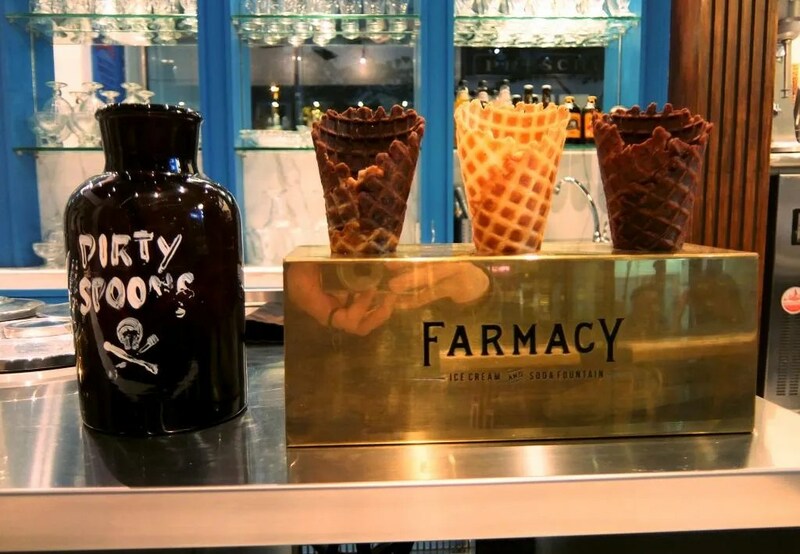 Farmacy made brilliant use of their space. Having an almost bar-like set up was pretty much a smart thing to do. Not to forget, it adds to the whole retro-feel of the shop. The marble top is also nice. 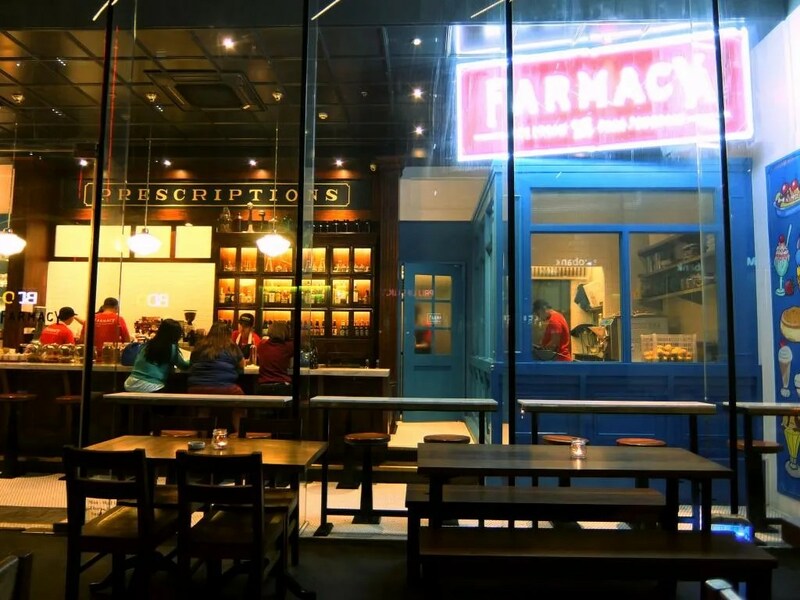 But in all seriousness, I think Farmacy has an identity-crisis in terms of its interiors. One side gives the whole antique-feel, another gives it the American in the 50s? I’m not so sure. I like this touch though close to where they store their ice cream! Specially the ‘dirty spoons’ jar. Whenever you taste a flavor, they give you a small silver spoon and you just place it inside the container. Overall, I’m happy with my two experiences. Farmacy is not hard to miss at all, and I’m jealous of my friends who work in Ogilvy because it’s situated just in front of their office. The place is hard to miss with its bright signage. 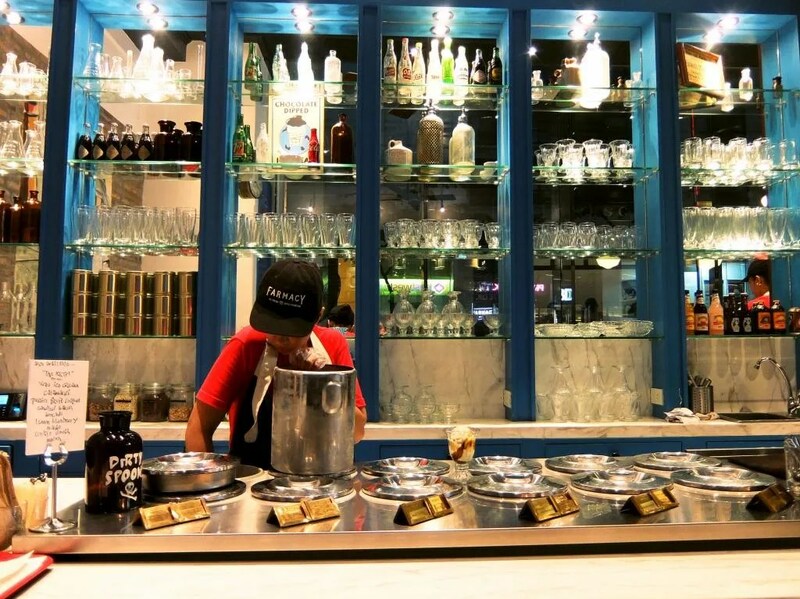 Farmacy Ice Cream and Soda Fountain is located at the 4th avenue corner 26th Street, Bonifacio Global City. Check out their Instagram!